Saturday 7th June to Monday 9th June 2014 – Chartres pilgrimage. With over 10,000 pilgrims, the Chartres pilgrimage is the single largest witness to Catholic traditionalism in the world. The three day march from the Cathedral Notre-Dame de Paris, to Notre-Dame de Chartres, is not for the feigned hearted. So to my knowledge, no one has yet put the two rites of Baptism side-by-side. So below (after my preliminary notes) is the Old Rite side by side with the New Rite. This is a reference free for all. The Novus Ordo Rite of Baptism is almost impossible to place side-by-side in equivalent parts, as vast sections have simply been removed, and wholly new ones put in. As you read through it, you will see there are areas which have been moved across to the Novus Ordo (with changes), but are usually transposed to a different part of the Rite. In addition the Ephphetha in the Novus Ordo is optional. As you will see the Rites are almost completely different to one another. One is anthropocentric (human-centred) in it’s perspective (Novus), the other Theocentric (God-centred) – (Usus Antiquor). Please note that I am a little confused as to why in the Novus Ordo they have the “Blessing and Invocation of God over Baptismal Water” at every Baptism, since a blessed object receives nothing extra from being blessed again. I don’t think that this part of the Rite is obligatory, but I’m not sure. Lastly, the Novus Ordo Rite of Baptism given below is as per the 1965 Roman Missal (updated), I have only taken options A, and that I think very few people would experience Baptism strictly according to the words and rubrics here presented, innovation is king. Priest: N., what do you ask of the Church of God? Parents: N.
Sponsor/Catechumen: Faith. Celebrant: What do you ask of God’s Church for N.? Priest: What does Faith offer you? Parents: Baptism. Priest: If then you desire to enter into life, keep the commandments. ‘Thou shalt love the Lord thy God with thy whole heart and with thy whole soul and with thy whole mind; and thy neighbour as thyself.’ Celebrant speaks to the parents in these or similar words: You have asked to have your child baptized. In doing so you are accepting the responsibility of training him (her) in the practice of the faith. It will be your duty to bring him (her) up to keep God’s commandments as Christ taught us, by loving God and our neighbor. Do you clearly understand what you are undertaking? The priest then breathes 3 times on the candidate in the form of a Cross, recalling the Spirit (breath, wind, “ruach”) of God. Celebrant turns to the godparents and addresses them in these or similar words: Are you ready to help the parents of this child in their duty as Christian parents? Priest: Go forth from him (her), unclean spirit, and give place to the Holy Spirit, the Paraclete. Godparents: We do. Celebrant: N., the Christian community welcomes you with great joy. in its name I claim you for Christ our Savior by the sign of his cross. I now trace the cross on your forehead, and invite your parents (and godparents) to do the same. The priest now makes the Sign of the Cross with his thumb on the candidate’s forehead and breast. He signs the child on the forehead, in silence. Then he invites the parents and (if it seems appropriate) the godparents to do the same. The celebrant invites the parents, godparents, and the others to take part in the liturgy of the word. If circumstances permit, there is a procession to the place where this will be celebrated, during which a song is sung e.g., Psalm 84: 7, 8, 9ab. Priest: Receive the Sign of the Cross both upon your forehead + and also upon your heart +; take to you the faith of the heavenly precepts; and so order your life as to be, from henceforth, the temple of God. Priest: Let us pray: Mercifully hear our prayers, we beseech Thee, O Lord; and by Thy perpetual assistance keep this Thine elect, N, signed with the sign of the Lord’s cross, so that, preserving this first experience of the greatness of Thy glory, he (she) may deserve, by keeping Thy commandments, to attain to the glory of regeneration. Through Christ our Lord. Sponsor/Catechumen: Amen. One or even two of the following gospel passages are read, during which all may sit if convenient. John 3: 1-6: The meeting with Nicodemus. Matthew 28: 18-20: The apostles are sent to preach the gospel and to baptize. Mark 1: 9-11: The baptism of Jesus. Mark 10: 13-16: Let the little children come to me. After the reading, the celebrant gives a short homily, explaining to those present the significance of what has been read. His purpose will be to lead them to a deeper understanding of the mystery of baptism and to encourage the parents and godparents to ready acceptance of the responsibilities which arise from the sacrament. The priest places his hands on the candidate’s head. After the homily, or in the course of or after the litany, it is desirable to have a period of silence while all pray at the invitation of the celebrant. If convenient, a suitable song follows, such as one chosen from nos. 225-245. Priest: Let us pray: Almighty, everlasting God, Father of our Lord Jesus Christ, look graciously down upon this Thy servant, N., whom Thou hast graciously called unto the beginnings of the faith; drive out from him (her) all blindness of heart; break all the toils of Satan wherewith he (she) was held: open unto him (her), O Lord, the gate of Thy loving kindness, that, being impressed with the sign of Thy wisdom, he (she) may be free from the foulness of all wicked desires, and in the sweet odor of Thy precepts may joyfully serve Thee in Thy Church, and grow in grace from day to day. Through the same Christ our Lord. Amen. Priest: Through the same Christ our Lord. Celebrant: My dear brothers and sisters, let us ask our Lord Jesus Christ to look lovingly on this child who is to be baptized, on his (her) parents and godparents, and on all the baptized. Sponsor/Catechumen: Amen Leader: By the mystery of your death and resurrection, bathe this child in light, give him (her) the new life of baptism and welcome him (her) into your holy Church. Now the priest puts a little blessed salt in the candidate’s mouth. Salt is the symbol of that wisdom which gives a relish for the sweetness of divine nourishment; preserves, by the teaching of the Gospel, from the corruption of sin, and prevents evil passions from growing in men’s souls. Adult catechumens might be signed on the brow, ears, eyes, nostrils, mouth, breast, and between the shoulders before the imposition of salt. If this procedure is followed, afterwards the candidate will kneel, recite the Our Father several times, and a Cross is made on his forehead, first by the sponsor and then by the priest. Leader: Through baptism and confirmation, make him (her) your faithful follower and a witness to your gospel. Priest: N., Receive the salt of wisdom; let it be to thee a token of mercy unto everlasting life. May it make your way easy to eternal life. All: Lord, hear our prayer. Sponsor/Catechumen: Amen. Leader: Lead him (her) by a holy life to the joys of God’s kingdom. Priest: Peace be with you. All: Lord, hear our prayer. Sponsor/Catechumen: And with your spirit. Leader: Make the lives of his (her) parents and godparents examples of faith to inspire this child. Priest: Let us pray: O God of our fathers, O God the Author of all truth, vouchsafe, we humbly beseech Thee, to look graciously down upon this Thy servant, N., and as he (she) tastes this first nutriment of salt, suffer him (her) no longer to hunger for want of heavenly food, to the end that he (she) may be always fervent in spirit, rejoicing in hope, always serving Thy name. Lead him (her), O Lord, we beseech Thee, to the laver of the new regeneration, that, together with Thy faithful, he may deserve to attain the everlasting rewards of Thy promises. Through Christ our Lord. All: Lord, hear our prayer. Priest: Through the same Christ our Lord. Leader: Keep his (her) family always in your love. Sponsor/Catechumen: Amen All: Lord, hear our prayer. Leader: Renew the grace of our baptism in each one of us. Priest: I exorcise thee, unclean spirit, in the name of the Father + and of the Son, + and of the Holy + Spirit, that thou goest out and depart from this servant of God, N. For He commands Thee, accursed one, Who walked upon the sea, and stretched out His right hand to Peter about to sink. Therefore, accursed devil, acknowledge thy sentence, and give honor to the living and true God: give honor to Jesus Christ His Son, and to the Holy Spirit; and depart from this servant of God, N. because God and our Lord Jesus Christ hath vouchsafed to call him (her) to His holy grace and benediction and to the font of Baptism. Holy Mary, Mother of God. All: Pray for us. Saint John the Baptist. All: Pray for us. The priest again makes the Sign of the Cross on the candidate’s forehead Saint Joseph. All: Pray for us. Priest: And this sign of the holy Cross, which we make upon his (her) forehead, do thou, accursed devil, never dare to violate. Saint Peter and Saint Paul. All: Pray for us. Sponsor/Catechumen: Amen All holy men and women. All: Pray for us. For the final time, the priest lays his hand on the candidate’s head Celebrant: Almighty and ever-living God, you sent your only Son into the world to cast out the power of Satan, spirit of evil, to rescue man from the kingdom of darkness, and bring him into the splendor of your kingdom of light. We pray for this child: set him (her) free from original sin, make him (her) a temple of your glory, and send your Holy Spirit to dwell with him (her). We ask this through Christ our Lord. Priest: Let us pray: O Holy Lord, Father Almighty, Eternal God, Author of light and truth, I implore Thine everlasting and most just goodness upon this Thy servant N., that Thou wouldst vouchsafe to enlighten him (her) with the light of Thy wisdom: cleanse him (her) and sanctify him (her), give unto him (her) true knowledge; that, being made worthy of the grace of Thy Baptism, he (she) may hold firm hope, right counsel and holy doctrine. All: Amen. Sponsor/Catechumen: Amen. Celebrant: We anoint you with the oil of salvation in the name of Christ our Savior; may he strengthen you with his power, who lives and reigns for ever and ever. The priest lays the end of his stole on the candidate as a symbol of his priestly authority, and admits him into the church building, which is the symbol of the Church of Christ. If the catechumen is an adult and was annointed in Part I above, he may be asked to lie prostrate before the Altar in adoration of Christ before this next step. He anoints the child on the breast with the oil of catechumens. Then they go to the baptistry, or to the sanctuary when baptism is celebrated there on occasion. Priest: N., enter thou into the temple of God, that thou mayest have part with Christ unto life everlasting. Sponsor/Catechumen: Amen. Celebrant: My dear brothers and sisters, we now ask God to give this child new life in abundance through water and the Holy Spirit. Sponsor/Catechumen: I believe in God the Father Almighty, Creator of heaven and earth, and in Jesus Christ his only Son our Lord, who was conceived by the Holy Ghost, born of the Virgin Mary; suffered under Pontius Pilate, was crucified, dead, and buried. He descended into Hell. On the third day, He rose again from the dead. He ascended into heaven, and sitteth at the right hand of God the Father Almighty; from thence shall He come to judge the living and the dead. I believe in the Holy Ghost, the holy Catholic Church; the communion of saints; the forgiveness of sins; the resurrection of the body, and life everlasting. Amen. Then, turning to the font, he says the following blessing (outside the Easter season). Sponsor/Catechumen: Our Father, who art in heaven, hallowed be thy name. Thy kingdom come. Thy will be done on earth as it is in heaven. Give us this day our daily bread. And forgive us our trespasses, as we forgive them that trespass against us. And lead us not into temptation: but deliver us from evil. Amen. Celebrant: Father, you give us grace through sacramental signs, which tell us of the wonders of your unseen power. In baptism we use your gift of water, which you have made a rich symbol of the grace you give us in this sacrament. At the very dawn of creation your Spirit breathed on the waters, making them the wellspring of all holiness. The waters of the great flood you made a sign of the waters of baptism, that make an end of sin and a new beginning of goodness. Through the waters of the Red Sea you led ?Israel out of slavery, to be an image of God’s holy people, set free from sin by baptism. In the waters of the Jordan your Son was baptized by John and anointed with the Spirit. Your Son willed that water and blood should flow from his side as he hung upon the cross. After his resurrection he told his disciples: “Go out and teach all nations, baptizing them in the name of the Father, and of the Son, and of the Holy Spirit.” Father, look now with love upon your Church, and unseal for her the fountain of baptism. By the power of the Spirit give to the water of this font the grace of your Son. You created man in your own likeness: cleanse him from sin in a new birth to innocence by water and the Spirit. The celebrant touches the water with his right hand and continues: We ask you, Father, with your Son to send the Holy Spirit upon the water of this font. May all who are buried with Christ in the death of baptism rise also with him to newness of life. We ask this through Christ our Lord. Celebrant speaks to the parents and godparents in these words: Dear parents and godparents: You have come here to present this child for baptism. By water and the Holy Spirit he (she) is to receive the gift of new life from God, who is love. On your part, you must make it your constant care to bring him (her) up in the practice of the faith. See that the divine life which God gives him (her) is kept safe from the poison of sin, to grow always stronger in his (her) heart. If your faith makes you ready to accept this responsibility, renew now the vows of your own baptism. Reject sin; profess your faith in Christ Jesus. This is the faith of the Church. This is the faith in which this child is about to be baptized. The priest takes a little spittle and touches the ears and nostrils of the candidate with it. For health reasons, the use of spittle may be omitted. This rite comes from Mark 7:33-35, when Jesus healed the deaf-mute: “And taking him from the multitude apart, he put his fingers into his ears: and spitting, he touched his tongue. And looking up to heaven, he groaned and said to him: Ephpheta, which is, Be thou opened. And immediately his ears were opened and the string of his tongue was loosed and he spoke right.”. Celebrant: Do you reject Satan? Priest: Ephpheta, that is to say, Be opened, for an odour of sweetness. Be thou, devil, begone; for the judgement of God shall draw near. Parents and Godparents: I do. Celebrant: And all his works? Priest: N., do you renounce Satan? Parents and Godparents: I do. Sponsor/Catechumen: I do renounce him. Celebrant: Do you believe in God, the Father almighty, creator of heaven and earth? Priest: And all of his works? Parents and Godparents: I do. Sponsor/Catechumen: I do renounce him. Celebrant: Do you believe in Jesus Christ, his only Son, our Lord, who was born of the Virgin Mary, was crucified, died, and was buried, rose from the dead, and is now seated at the right hand of the Father? Priest: And all his pomps? Parents and Godparents: I do. Sponsor/Catechumen: I do renounce him. Celebrant: Do you believe in the Holy Spirit, the holy catholic Church, the communion of saints, the forgiveness of sins, the resurrection of the body, and life everlasting? Parents and Godparents: I do. Priest: I annoint you + with the oil of salvation in Christ Jesus our Lord, that you may have everlasting life. Celebrant: This is our faith. This is the faith of the Church. We are proud to profess it, in Christ Jesus our Lord. The priest removes his violet stole and puts on a white one. Celebrant: Is it your will that N. should be baptized in the faith of the Church, which we have all professed with you? Parents and Godparents: It is. Priest: N., do you believe in God the Father Almighty, Creator of Heaven and Earth? He baptizes the child, saying: N., I baptize you in the name of the Father, He immerses the child or pours water upon it. and of the Son, He immerses the child or pours water upon it a second time. and of the Holy Spirit. He immerses the child or pours water upon it a third time. After the child is baptized, it is appropriate for the people to sing a short acclamation. Priest: Do you believe in Jesus Christ, His only Son our Lord, Who was born and Who suffered? Celebrant: God the Father of our Lord Jesus Christ has freed you from sin, given you a new birth by water and the Holy Spirit, and welcomed you into his holy people. He now anoints you with the chrism of salvation. As Christ was anointed Priest, Prophet, and King, so may you live always as a member of his body, sharing everlasting life. Sponsor/Catechumen: I do believe. All: Amen. Priest: Do you believe in the Holy Ghost, the Holy Catholic Church, the communion of Saints, the forgiveness of sins, the resurrection of the body and life everlasting? Then the celebrant anoints the child on the crown of the head with the sacred chrism, in silence. Celebrant: N., you have become a new creation, and have clothed yourself in Christ. See in this white garment the outward sign of your Christian dignity. With your family and friends to help you by word and example, bring that dignity unstained into the everlasting life of heaven. If the one to be baptized is a baby, the godparents take him to the font (the godmother holds him in her arms, the godfather touches the baby’s shoulder with his right hand); if he is an adult, the sponsor puts his right hand on the shoulder of the one to be baptized. All: Amen. Priest: N., will you be baptized? The white garment is put on the child. A different color is not permitted unless demanded by local custom. It is desirable that the family provide the garment. The priest pours water over the head of the candidate three times, once after each mention of the Divine Persons. The water he uses will have been consecrated during the Easter Vigil or on the Eve of the Pentecost. As he pours the water, the priest says these words (or the words of a conditional Baptism): Celebrant takes the Easter candle and says: Receive the light of Christ. Priest: I baptize you in the name of the Father + and of the Son + and of the Holy + Spirit. Someone from the family (such as the father or godfather) lights the child’s candle from the Easter candle. Celebrant then says: Parents and godparents, this light is entrusted to you to be kept burning brightly. This child of yours has been enlightened by Christ. He (she) is to walk always as a child of the light. May he (she) keep the flame of faith alive in his (her) heart. When the Lord comes, may he (she) go out to meet him with all the saints in the heavenly kingdom. Priest: May the Almighty God, the Father of our Lord Jesus Christ, Who hath regenerated thee by water and the Holy Spirit, and who hath given thee the remission of all thy sins, may He Himself + anoint thee with the Chrism of Salvation, in the same Christ Jesus our Lord, unto life eternal. Priest: Peace be with you. The Lord Jesus made the deaf hear and the dumb speak. May he soon touch your ears to receive his word, and your mouth to proclaim his faith, to the praise and glory of God the Father. Sponsor/Catechumen: And with your spirit. All: Amen. This priest takes a white linen cloth — symbolizing the purity of a soul cleansed from all sin, and a relic of the days when the newly baptised wore white albs for 8 days — and places it on the head of the candidate. Next there is a procession to the altar, unless the baptism was performed in the sanctuary. The lighted candle is carried for the child. A baptismal song is appropriate at this time, e.g. : You have put on Christ, in him you have been baptised. Alleluia, alleluia. Priest: Receive this white garment, which mayest thou carry without stain before the judgment seat of our Lord Jesus Christ, that thou mayest have life everlasting. Our Father, who art in heaven, hallowed be thy name; thy kingdom come, thy will be done on earth as it is in heaven. Give us this day our daily bread; and forgive us our trespasses as we forgive those who trespass against us; and lead us not into temptation, but deliver us from evil. Priest: N., go in peace and the Lord be with you. Amen. Celebrant: God the Father, through his Son, the Virgin Mary’s child, has brought joy to all Christian mothers, as they see the hope of eternal life shine on their children. May he bless the mother of this child. She now thanks God for the gift of her child. May she be one with him (her) in thanking him for ever in heaven, in Christ Jesus our Lord. Celebrant: By God’s gift, through water and the Holy Spirit, we are reborn to everlasting life. In his goodness, may he continue to pour out his blessings upon these sons and daughters of his. May he make them always, wherever they may be, faithful members of his holy people. May he send his peace upon all who are gathered here, in Christ Jesus our Lord. Celebrant: May almighty God, the Father, and the Son, + and the Holy Spirit, bless you. After the blessing, all may sing a hymn which suitably expresses thanksgiving and Easter joy, or they may sing the song of the Blessed Virgin Mary, the Magnificat. Where there is the practice of bringing the baptised child to the altar of the Blessed Virgin Mary, this custom is observed if appropriate. I introduced the importance for a Catholic Scout (and Catholics as a whole), to understand the Principles of War. I then went on to describe the method of the Dark Lords attack; subversion, and how modern tactics have attempted to tackle that problem. Firstly, before undertaking the task of opposing the Dark Lord, his legions of hell and his agents on earth, it is very important to understand the enemy. Firstly, from this fact, it is important to realise that any human effort to construct a strategy against the Dark Lord, is futile, because of the vast intellect and power that incorporeality and immortality grants the Dark Lord and his Legions of Hell. Secondly, our Catholic Faith has condemned the concept that a human is able to strategise against the Dark Lord without the aid of Sanctifying Grace (Pelagianism). So if it futile for you or me to strategise, because the Dark Lord is able to witness our strategies and neuter them in ways we could not even imagine. And even the belief that a human could strategise against the Dark Lord (without the aid of Sanctifying Grace), is condemned by the Catholic Church. Just how, then, can one oppose the Dark Lord? Well, the answer is actually quite easy, the key is Sanctifying Grace. There is One who has a Greater Intellect than the Dark Lord and all his Legions of Hell put together. He has strategies. Like a good Commander He does not reveal the full battle plan to the soldiers, rather He gives them specific orders, He does not explain why (nor is He required to). The soldiers are us. The issue is that we must put ourselves into a position by which we can receive those orders and do them. That calls for Sanctifying Grace, for Our Catholic Faith, teaches us that we cannot do anything good without Grace (cf Council of Carthage 419 – Canon 113). And remember that while we can do nothing good without Grace, Grace does not make us infallible if we revert to trying to work things out on our own power. What I am therefore saying is; God has a plan. He has specific actions for an individual soul to take. He can, and will, communicate those actions to that individual soul, if (and usually only if) a soul is in the state of Sanctifying Grace. By those plans alone is there hope that the Dark Lord will be defeated (and it is the only way that he will be defeated – and he most certainly will be defeated by these means). Of course this requires cleaning out everything that stands in the way of Grace, then after doing that, listening to what the Lord desires us to do and doing it! But what I have said here is nothing different than what Our Lord said in the Gospels (just said differently). So, the key to us mortals is just how do we obtain Grace by which we can then do effective battle with the Dark Lord (and win)? Well that’s content for my next post. But as a sneak peak it involves: Surrender, repentance, confession and penance, followed by receiving guidance, and taking action. I introduced the importance for a Catholic Scout (and Catholics as a whole), to understand the Principles of War. J R R Tolkien states something vitally important about the enemy. Divide et impera, divide and conquer. The Church Militant is constantly, and will constantly be attacked by divisive tactics. Why? Well, apart from the fact that Diabolos comes from the Greek verb “to divide”, because as military doctrine points out, it is both highly efficient and effective. The most valuable of these tactics is the last. Subversion. There is a minimal “cost” to the aggressor, and very high “cost” to the defender. In researching this article I came across a very interesting (if not now quite antiquated) article on RAND on Countering Covert Aggression, which a Catholic should be able to “translate” using their imagination. I understand subversion, and I see the effects of subversion on the Church. The question is just how does one counter subversion in the Church? What are the sources of covert aggression? We all know who the Dark Lord is, we all know that the source of covert aggression starts with the Legions of Hell. But what are their agents upon earth? Well, there is no easy answer to that, anyone who loves sin is an agent. But there are organisations that are intent upon destroying the Church [epic fail – they just don’t get it do they], such as Freemasons, Communists, Satanists, militant homogenos erotomaniacs (and their sympathisers), militant pro-death lobbyists, Mohammedans, Idolators, Heretics, Schismatics and the likes. Now you might say “that is a bit rich”, but before I get burned at the stake, let me point out; anyone who loves sin is an agent of the Legions of Hell. What constitutes “direct action”? NOT VIOLENCE AND ENMITY!!! Direct action consists of taking Christ-like actions towards the source. Not concealing the Truth, but correcting error. And dying for it if necessary. What does “a more professional military” mean in terms of the Church? Well, this could be on all levels. We all are Church Militant, so more professionalism across the board, better catechetical formation, regimentation, drilling and exercise. Better weapons training: Prayer, Alms and Fasting, Rhetoric training, Apologetics training, growth in personal holiness. Better defensive training: Sacramentals, life of prayer, frequentation of Sacraments. But in addition to this, it calls for more professional Officers Training (meaning Priests). The Church could also be seen in terms of an army. Your laity are privates, you’ll have some NCO’s in there too. Your Commissioned Officers are Priests, Bishops and the Pope (men only, sorry ladies). They need to understand that there is a war going on, and that they are Officers called to lead, not to worldly arms, but to spiritual ones. For worldly arms, violence and enmity were completely rejected by Christ. One may well have noticed that this quote is a permanent feature of my blog. At least until I work out a way for WordPress.com to do scrolling quotes, then I will add more. But this particular quote has a deep truth to it. A deep truth which is not only vital to the Catholic Scout, but also to the forces that oppose the Dark Lord. Of course, Our Lord Jesus Christ talked about the subject when people accused him of casting out devils by Beelzebub. And the scribes who were come down from Jerusalem, said: He hath Beelzebub, and by the prince of devils he casteth out devils. And after he had called them together, he said to them in parables: How can Satan cast out Satan? And if a kingdom be divided against itself, that kingdom cannot stand. And if a house be divided against itself, that house cannot stand. And if Satan be risen up against himself, he is divided, and cannot stand, but hath an end. Here the Divine Redeemer points out, Satan is not divided against himself. 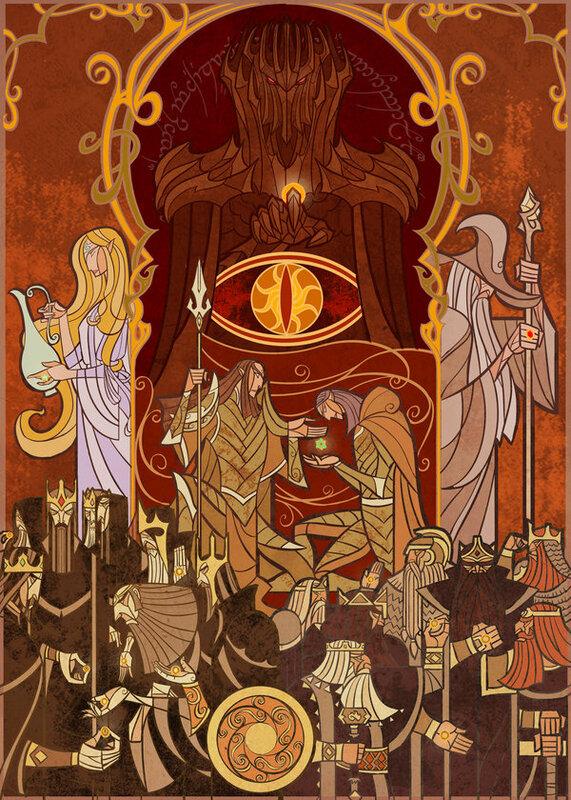 And yet, J R R Tolkien utters a Truth through the mouth of Haldir. “In nothing is the power of the Dark Lord more clearly shown than in the estrangement that divides all those who still oppose him.” How true is it, that estrangement, that divides all of us who oppose Satan. Even within our respective liturgical and theological “sensibilities”. Take for instance, Catholic Traditionalism. How often is it easy to find estrangements dividing one from another. Petty reasons, serious reasons. But Christ said it “if a house be divided against itself, that house cannot stand“. This is a serious issue, but it is compounded by Original Sin, which has fractured and continues to fracture humanity as a whole, and the human being as an individual. So it’s part of our fallen nature. Even after Baptism, we still suffer from the tendency, otherwise known as concupiscence. Christianity has always called the soul to strive towards perfection. But as I have noted elsewhere, Catholicism while calling the soul to strive towards perfection, calls the soul to do so in a particular way. Catholicism is not Pelagianist. Pelagianism is a word which has now come back out of the closet with the current Supreme Pontiff. People have speculated that Pope Francis was referring to Traditionalists as suffering from Pelagianism. If it turns out that was what Pope Francis was referring to, well it may be the case in some instances, but certainly not for the vast, vast majority. God bless his soul! Traditional Catholics draw upon solid Catechism. Only by using one’s Intellect and one’s Will to cooperate with Divine Grace can we advance towards perfection. Understanding that one can use the Intellect and Will in order to cooperate with Divine Grace. Prior to 1965 the Roman Rite of the Catholic Church was singular, sacred, universal and had developed organically almost two millennia. Singular. There was one Roman Rite, one set of Roman Rite Rubrics. Sacred. No-one thought for a moment that they could mess around with this bit or that bit. Universal. There was one language, no matter where you went, it was the same. Ancient. The Mass was truly ancient, passed from Pope to Pope down the generations. But you knew that right? Well, what you probably didn’t know is that the people who were attached to this Rite, after the Second Vatican Council changes remained one homogeneous group. There was no distinction between those going to the SSPX or going to other “flying priests”. You knew that too? When the SSPX had the carpet pulled from underneath their feet in 1975, they continued to function. But still the laity, more or less, formed a single homogeneous group. Between these two groups an animosity grew, basically centred around the trauma of the split, and squabbles over who was right and who was wrong. It basically continues today. The lines are not absolutely cut and dry, black or white, but more or less it describes the situation. Of course what does not help the situation is Extra Ecclesia Nulla Salus statements that are constantly fired from one side or the other, aimed at the laity of those two groups. I think few people understand just how terribly painful that split was. Few people want to remember it. And few people want to now look back at it and analyse it. I think that needs to change. Because as it stands, I suspect, that the Ecclesia Dei-associated laity in the UK may not have Critical Mass in order to avoid amalgamation. I’m not factoring in Divine Action here, but the numbers simply don’t add up. And that worries me. A single, unambiguous aim is the keystone of successful military operations. Selection and maintenance of the aim is regarded as the master principle of war. Morale is a positive state of mind derived from inspired political and military leadership, a shared sense of purpose and values, well-being, perceptions of worth and group cohesion. Offensive action is the practical way in which a commander seeks to gain advantage, sustain momentum and seize the initiative. Security is the provision and maintenance of an operating environment that affords the necessary freedom of action, when and where required, to achieve objectives. Surprise is the consequence of shock and confusion induced by the deliberate or incidental introduction of the unexpected. Concentration of force involves the decisive, synchronized application of superior fighting power (conceptual, physical, and moral) to realize intended effects, when and where required. Economy of effort is the judicious exploitation of manpower, materiel and time in relation to the achievement of objectives. Flexibility – the ability to change readily to meet new circumstances – comprises agility, responsiveness, resilience, acuity and adaptability. Cooperation entails the incorporation of teamwork and a sharing of dangers, burdens, risks and opportunities in every aspect of warfare. To sustain a force is to generate the means by which its fighting power and freedom of action are maintained. The Catholic Scout, needs to understand these principles and, to practice them in the understanding that we are at war, with principalities and powers (meaning the legions of hell). We Catholics need to understand these principles, and pay particular attention to Concentration of Force, Economy of Effort and Cooperation. We have much to remember, and to implement. Time to get back to work! Like any good old book, within the first few pages the author stated his intention in writing the book. The whole thing-the early voyage through the easy running stream, and then coming out on to the broad lake, the arising of difficulties, the succession of waves and rocks only avoided by careful piloting, the triumph of overcoming the dangers, the successful sliding into a sheltered landing-place, the happy camp-fire and the sleep of tired men at night – is just what a man goes through in life; but too often he gets swamped among the difficulties or temptations on the rough waters, mainly because he has not been warned what to expect and how to deal with them. I have quoted a few of Stewart White’s practical hints from his experiences in paddling through sea-ways: I want in the following pages to offer you similar piloting hints from my own experiences of dealing with the different snags and waves that you are likely to meet with in paddling through your life-ways. Among these rocks and breakers are those that can be labelled in the terms of the old toast, “Horses, Wine and Women,” with the addition of Cuckoos and Cant. You are bound to come across most of them in your time. In the following chapters I propose to show you there are good as well as dangerous points about these rocks, and also how by “rovering” you may not only get round them, but also derive advantage and make your way to success. Rovering to Success was written by Lord Baden Powell in response to young men who were either too old to join Scouts, or who had been through Scouting and wanting some further direction. 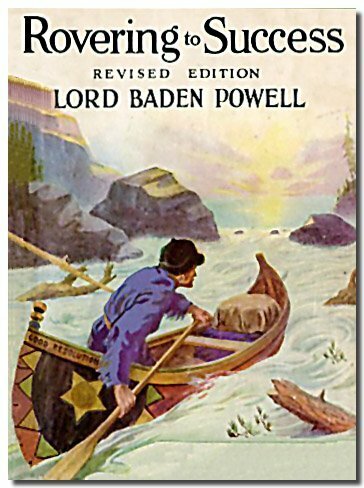 Bear in mind that the book was written in 1922, and also that Lord Baden Powell was not a Catholic. That being said, the book is a gem, it will have you laughing, it will have you crying out “why didn’t I have this book sooner!! !”, but most of all you will learn something that may inspire you, may indeed, change your life. In some ways the book is prophetic, Lord Baden Powell was a realist, with a wealth of life experience, that many of us could only dream of. He was able to see, if one did X, then the result will be Y. His life experience and his approach to life (senses open to take in the objective truth of the surroundings) meant that he was able to provide incredible advice for avoiding obstacles, “rocks” as he calls them. And don’t think he is saying that Females are obstacles to be avoided. Read the book, I would be very surprised to find out if you disagree with what he says. Some areas have been proven different by scientific discovery after Baden Powell’s time, but his knowledge, logic and deduction are outstanding if one considers the context of his time. Obviously some of the things in the book I disagree with, but that’s mainly down to two things; I believe in the Truth of the Catholic Faith (there is no other way to God), and I also believe very strongly (if you hadn’t guessed already), that Christ was very serious when He commanded us to love friends and enemies, that violence is an abomination and completely forbidden to the follower of Christ. My strong conviction to Gospel non-violence (which I always need to add, is not doing nothing in the face of evil, rather actively confronting evil with the Power of Good – (non-violently! )), jars in the face of some aspects of Baden Powell’s Scouting. But that aside, it is an immensely enjoyable book. Of course, like Scouting for Boys, Rovering is designed for the male audience. Baden Powell came from a time, where people understood, the fundamental difference of gender. That it was God-given and for a Divinely-mandated Purpose (cf Matthew 19). Baden Powell, extrapolated the male role (with his philosophical and theological understanding) out into the world, to the service of the state. It’s a ripping read, and really hard to get hold of. I managed to get my hands on a copy many moons ago, and you still can if you search for a second-hand copy of Rovering to Success through book stores on line. That or look up the scanned copy of Rovering to Success by Baden Powell available on line. Catholic Scouting – but why? Sedevacantism? Sedevacantists? No, not a great idea. Habemus Papam – Pope Francis – Gift of the Holy Ghost? We see here that Our Lord specifically gives Peter the power to bind and loose. In the last article Pope Francis in a very verbose way said “don’t do violence”. But I may ask, Did our Lord “advise” us not to do violence? Advising this or that, gives to me at least, the impression that there is an option. The Pope is the supreme authority in the Catholic Church, he has the authority to order. Orders have a clarity about them, they have a purpose. Advice may be good, but it is not a binding order. Job done. People won’t like it, there will be a hell of a hoo-har. But think about it, just how much easier is it to follow a clear, precise directive, which is very black or white. When you move past the shock of the statement, there is a “oh okay” moment and we get on with it. Take it further, if the Pope stood up and did proclaim that, 1/3 of the worlds population would be under the binding law to put up their weapons and ceasefire, that or renounce their Faith. Then we’d see who was really Catholic. Think of all the Catholic politicians, Catholic military men (and sadly women), Catholic educators, Catholic entertainers, who would have to do a complete about face. The problem is while Pope Francis says “Peace, peace” in mind-numbingly-long homiletics. The world turns around and (if it even managed to get to the end of the homily) says “Francis, you are a hypocrite”, pointing to Just War Theory and millennia of violent Catholic Christianity. And to be fair, they have a point. Well, dear Holy Father, with all respect, let’s cut the legs from beneath them, in one fell swoop. As someone pointed out, the Church’s seemingly schizophrenic historical teaching on violence is the predominant reason why the Church has not had the impact on Pro Life issues that it should have. Why should the Pro-Death’er not kill the human in utero, if “Pro-Life” Catholics can kill them post utero? “Just what’s the difference?” They will say. Tough, not very palatable, plenty of defensive rhetoric can be given to it (helpless, vulnerable, no ability to reason), but, fundamentally, this is an unassailable position for the Pro-Death’ers. Now imagine a Catholic Church which condemned all violence, in utero and post utero. The Pro-Death’ers would have nothing to stand on. Stop the verbal diarrhoea. Cut to the chase. Nail your colours to the mast.